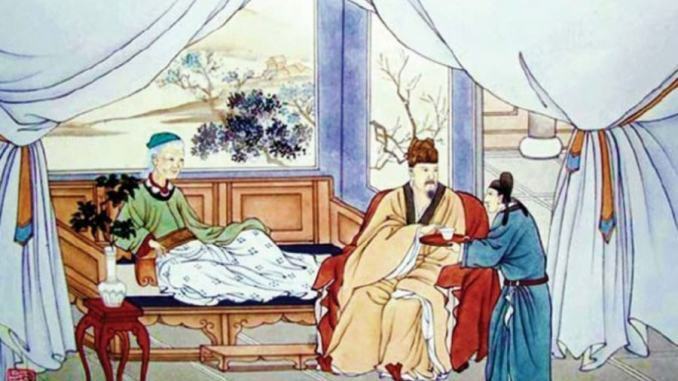 Emperor Han Wendi (Western Han Dynasty) tastes his mother’s herbal medicine first, to ensure it is not too hot before feeding it to his sick mother. 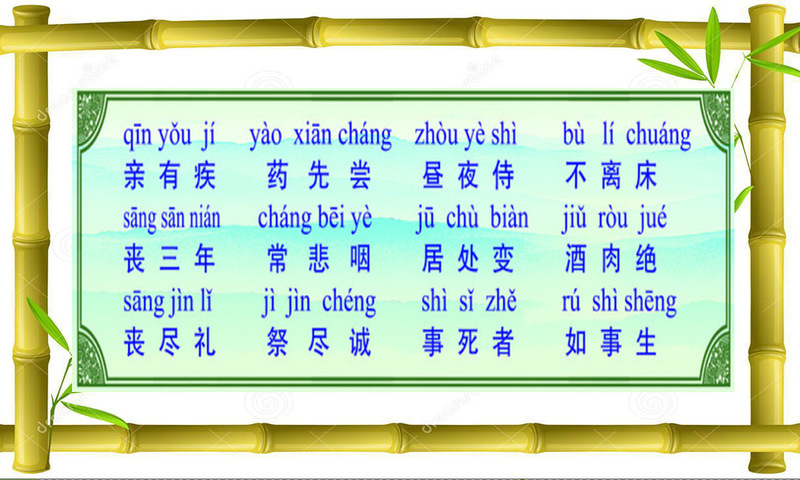 Dizi Gui (弟子规) states that we should take care of our ill parents, and attend to them day and night without leaving their bedside. When our parents have passed on, we should always remember them with gratitude, and feel sad for not being able to repay them for raising us. We should commemorate our parents’ anniversaries in memorial ceremonies with ulmost sincerity, and serve our departed parents as if they were still alive. Such moral exemplars of serving one’s parents are Emperor Wen of the Western Han Dynasty, and the teacher Wang Pou from the Three Kingdom Period. 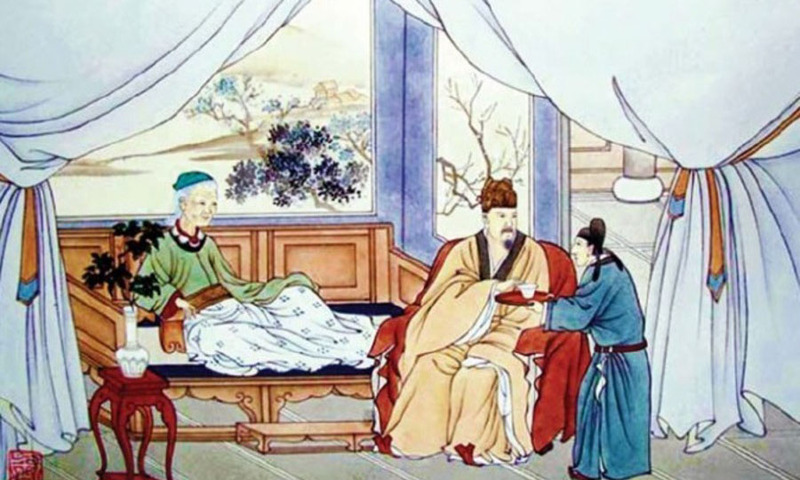 During the Western Han Dynasty in China, after its founding patriarch Liu Bang died, the throne was passed down to his son, Liu Heng or “Liu the Constant”. Liu was given the name of Han Wendi, “The Learned Emperor of Han”. As a ruler, he practiced rigorous, just governance, and he loved the citizens, moving and inspiring them to self-improvement through education. While managing the extremely complex and demanding affairs of the state, Emperor Wen nonetheless still found time to serve his mother with respect and filial devotion. He was neither careless nor tardy in his treatment of his mother. Once, his mother suffered a serious illness. As soon as Han Wendi had completed his various governmental matters, he would immediately leave the state chambers and return to his mother’s bedside to nurse her with tender care. She was sick for a full three years, yet his care was constant and untiring. He waited on her night and day throughout her illness, without relaxing his vigilance in the least. He never grumbled or resented the toil and tedium. The Emperor’s care of his mother was thorough to the last detail. He would wait by her bedside without closing his eyes, often forgetting to change his robes for long periods out of fear that he might be remiss in his nursing care. As soon as the servants had prepared any dose of medicine, the Emperor would first sample the remedy himself, to make sure it was neither too hot nor too weak. When it was fit to drink, the Emperor would personally spoon-feed the medicine to his mother. Many years passed, and the Learned Emperor nursed his mother throughout, earning the praises of all the citizens. An outstanding leader, he was also a most unusual, filially-devoted son, and he set the standards of behavior towards parents. The people of China respected him, and were deeply influenced and transformed by his model of virtue. In turn, they practiced filial respect towards their parents, and treated them well. The Learned Emperor’s name, Han Wendi, has been passed down through a thousand ages to the present—people still admire his model of virtuous, selfless conduct. Wang Pou was a filial son who lived during the Three Kingdoms Period. Wang’s mother dreaded the sound of thunder, so whenever the sky filled with dark clouds and rain was on the way, Wang Pou would run to his mother’s side to comfort her and to calm her fears. If her son was not at her side, the old woman would feel unbearable alarm. Wang Pou always emphasised in his lessons the necessity of repaying the kindness of one’s parents while they are still alive. After his mother passed on, Wang Pou buried her in a neighbouring graveyard. Even though the old lady was no longer alive, everytime a storm approached, Wang would run to the graveyard and kneel by his mother’s tombstone with tears running down his cheeks. “Don’t cry Mother, your son is nearby!”, he would call, just as if his mother was alive. As long as the storm lasted, Wang remained near the grave, circling around it countless times to protect his mother’s spirit and keep her from fear. Later, when Wang Pou became a teacher, everytime he read a passage on the emotions felt by devoted sons and daughters for their departed parents, Wang’s own feelings would overflow, and he would cry with deep longing. After seeing this, his students would carefully remove any texts that talked about the love that children have for their parents. Wang Pou always emphasised in his lessons the necessity of repaying the kindness of one’s parents while they are still alive. He was considered a model for filial behaviour, and his constant regard for his departed mother moved the hearts of all those who witnessed it.